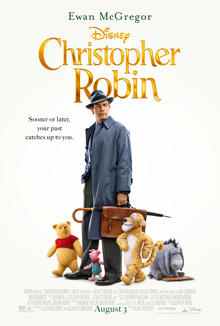 On Monday, July 8th we'll be watching Christopher Robin (2018, 103 minutes, PG). Christopher Robin -- now a family man living in London -- receives a surprise visit from his old childhood pal, Winnie-the-Pooh. With Christopher's help, Pooh embarks on a journey to find his friends -- Tigger, Eeyore, Owl, Piglet, Rabbit, Kanga and Roo. Once reunited, the lovable bear and the gang travel to the big city to help Christopher rediscover the joy of life.